Gingerbread Cheesecake is creamy and tangy and full of warm holiday flavors that is the perfect ending to your favorite holiday meal. 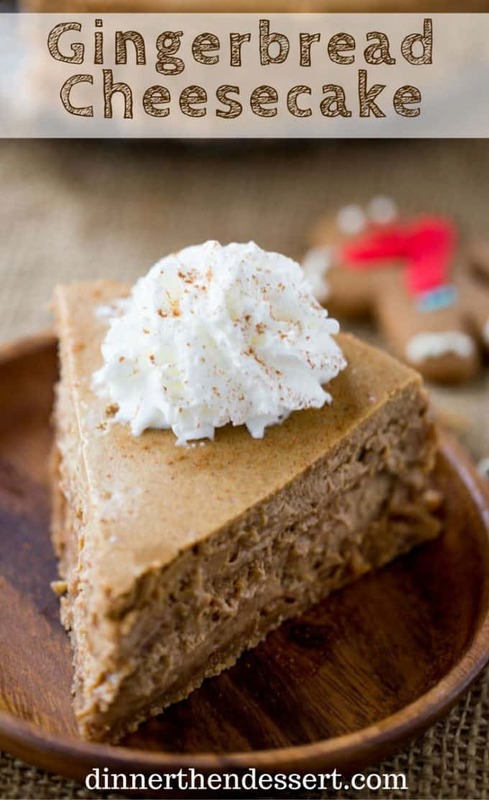 Gingerbread Cheesecake is the perfect marriage of the classic holiday gingerbread dessert and the always popular cheesecake. 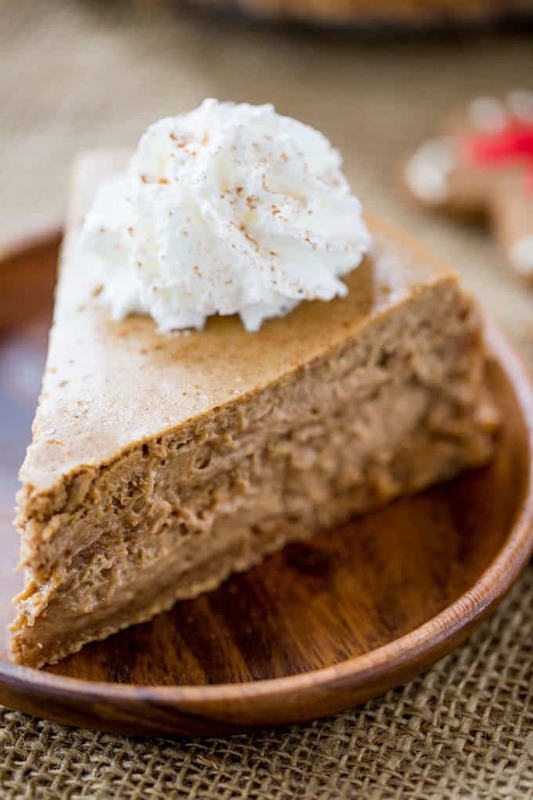 The warm spices and flavors of this cheesecake are really nostalgic for me as my grandmother used to make gingerbread cake for us every year during the holidays. 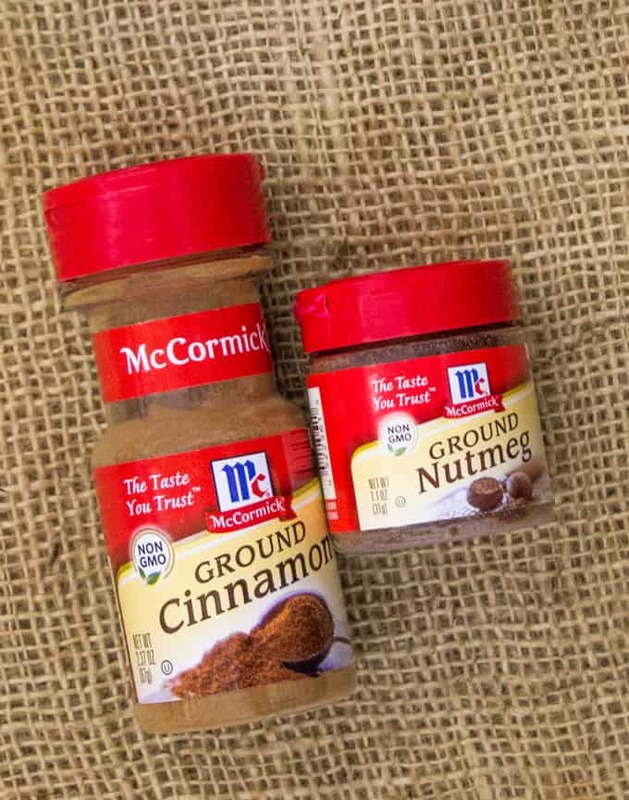 When McCormick® reached out to me to work together in creating a holiday recipe using some of their most amazing baking spices I was thrilled because I am obsessed with all things gingerbread and all things holidays! For proof check out my Gingerbread Cookies, Gingerbread Pancakes and Gingerbread Cheesecake Dip from last year, I am a lover of all things gingerbread. Flavors are memories to me. 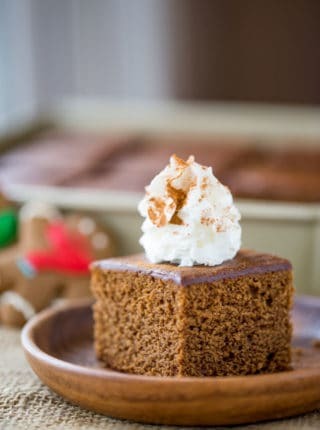 Aside from the gingerbread cake my grandmother used to make for us when we were kids the scent of these spices bring back memories of french toasts, German chocolate covered holiday cookies, pies and all the holiday seasons filled with goodies as a kid. 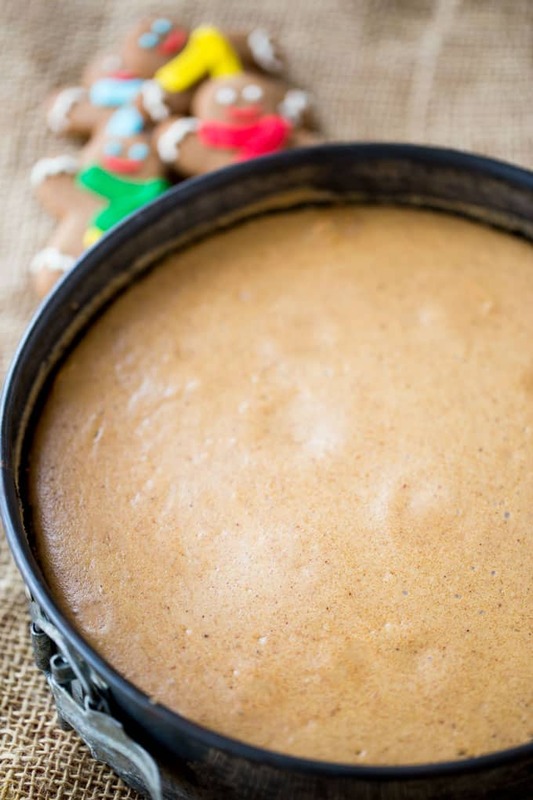 It all came flooding back into my head as I was baking this Gingerbread Cheesecake and the smell of these iconic flavors like McCormick Ground Cinnamon and McCormick Ground Nutmeg were wafting through the kitchen. If you’re as nostalgic for Gingerbread as I am and you’re already printing this Gingerbread Cheesecake out as we speak here are a couple of ideas to make it even more of a showstopper. Sometimes I make double the crust and put half on the bottom as described in the recipe and the other half through the middle of the batter layer for a delicious spiced ribbon of buttery cookies. Since it is in the middle it won’t bake crisp, it will be like cookie butter. To get the perfect top with no cracking at all, make sure you are using a water bath. To be clear about how to do it, you’re going to need a sheet of foil that is wider than your cheesecake pan, I find extra wide foil works perfectly on this. Then put the cheesecake pan in the middle of the sheet and press the sides of it up the outside of the pan. Put the pan in a larger pan and fill that outside pan with an inch of hot water. This controls how the heat cooks the cheesecake and now with the water bath it will cook it evenly for you. Cracked Gingerbread Cheesecake risk averted! Top the Gingerbread Cheesecake with mini gingerbread men. 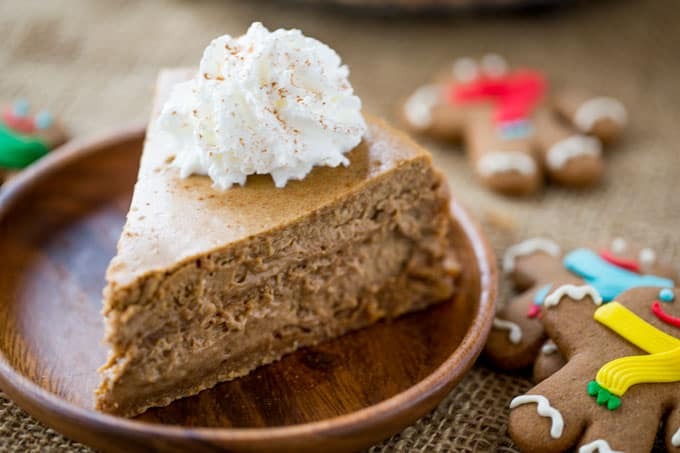 I use graham crackers and spices here on purpose because you can mimic the gingerbread flavor with all the same spices in the cheesecake so there is no need to waste delicious gingerbread cookies on the crust. But that doesn’t mean they can’t get used as decorations on top or even grated over the top instead of a dusting of spice. To slice the perfect slice of cheesecake make sure you have chilled it all the way through. Even better? Put it in the freezer 1-2 hours before serving and then slice for perfect slices. Wrap the outside of your springform pan in foil for a water bath. 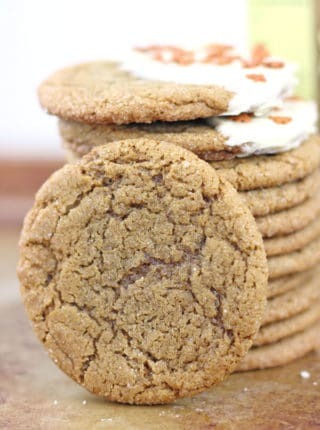 In a food processor add the graham crackers, ginger, cinnamon, nutmeg and melted butter and process for 15-20 seconds or until all the ingredients have a fine moist crumb. Add them to the bottom of the springform pan and press up the sides of the pan about an inch. In a stand mixer add the cream cheese and beat until fluffy. Add in the brown sugar and beat until fully combined, then add in the vanilla and the eggs one at a time. Add the molasses, salt, ginger, cinnamon, nutmeg and cloves on medium speed until fully combined. Pour into the springform pan, place the pan into a larger pan and fill the outer pan with an inch of hot water. Bake in a water bath for 60 minutes. When done baking turn the oven off and remove the pan from the water bath and just leave it in the oven to cool gently. Refrigerate for 6-8 hours or until fully chilled before serving. 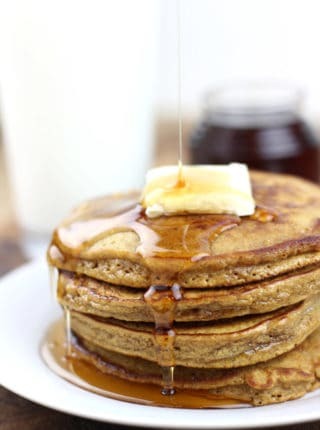 Serve with whipped cream dusted with cinnamon. This is a sponsored post written by me on behalf of McCormick®. I made this for a ladies Christmas lunch, and it was enjoyed by all. Sp glad to hear, Patty! Thanks for the 5 stars. For many years I have tried recipes trying to reproduce a pumpkin cheese cake that I had at Falling Water’s small restaurant in western PA. I found it this year!!! 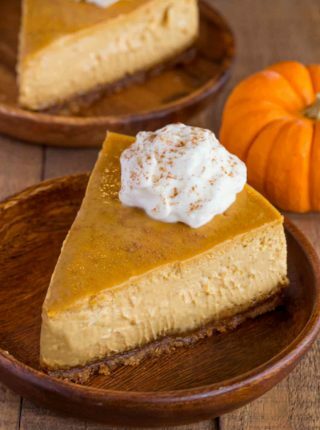 It’s Betty Crocker’s Layered Pumpkin Cheesecake. It has two layers – the top one is pumpkin, the bottom cream cheese cake, and a gingersnap crust! 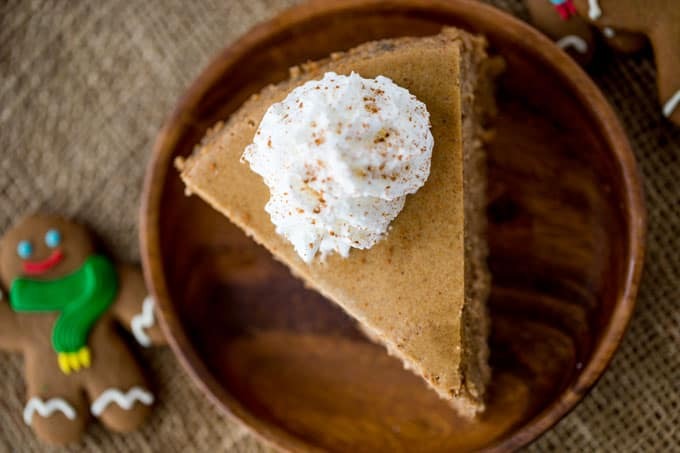 You could use the gingersnap crust instead of creating the one in this recipe. It’s just 2 cups of gingersnap crumbs and 1/4 c. of melted butter – great crust and so easy. No, I’m sorry but you really need molasses for this recipe. What size springform pan for this recipe? I have a 10″ but don’t know if that will affect the cooking time. I am planning on making this to bring to a Christmas dinner. Thank you. I used a 9 inch springform pan. It might take a little less time because it’s a little thinner in a 10 inch. Looks like I can adapt the crust for my 23 year old daughter who cannot eat gluten. Years ago she loved eating ginger bread and my molasses spice ginger cookies. I have a feeling this will bring back happy flavor memories of the past. That’s so sweet of you! Would you be able to make these as individual cheesecakes in a muffin pan? Do you not have to pre-bake the crust before adding the filling? No, it all gets baked at the same time. Enjoy! This cheesecake looks great! By chance would I be able to freeze it? I like to free up time Christmas Day ? So sorry for the delay but you can absolutely make this ahead of time and freeze it. Happy Holidays!! Looks incredible! But what kind of molasses did you use? I really want to try this now! So sorry for the delay. 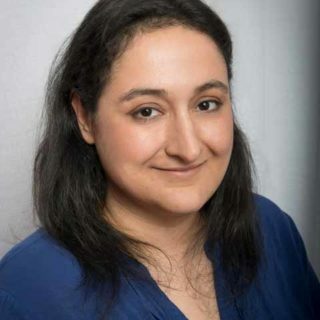 Here’s a link to the brand of molasses I use https://www.amazon.com/Brer-Rabbit-Molasses-Flavor-Natural/dp/B00CX16Q7K/ref=as_li_ss_tl?s=grocery&ie=UTF8&qid=1513883740&sr=1-3&keywords=brer+rabbit+molasses&th=1&linkCode=sl1&tag=cookingwithpoints-20&linkId=b27826ebc73d0a23276c6e238ca5d5c5. Easily ordered off of Amazon too! Oh my goodness yum! Can’t wait for the holidays to test this one out….maybe I won’t wait;-). Thanks for the recipe! How long do you leave it in the oven after you’ve taken it out of the pan with water? So sorry for the delay in responding, I hope you didn’t have a cheesecake in the oven when you asked. I usually leave it in there an hour or so just to let it cool gently. It reduces the risk of the cheesecake cracking. If it was in the oven when you asked and I am too late, I hope you enjoyed it and it worked out for you! Love that you made my favorite seasonal flavor into cheesecake, one of my all-time favorite desserts! Pinned! Thanks for the pin! Hope you enjoy it! 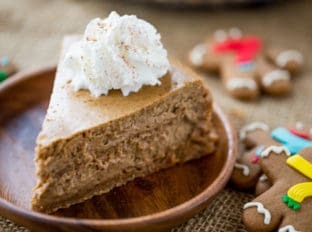 I’ve never had gingerbread cheesecake but it sounds amazing! I’ll have to try this soon! What size pan did you use for this recipe? 9 Inch springform pan, sorry for the oversight on that! This looks delicious! What size of springform pan did you use for yours? I am in heaven imagining the smells that must fill the house as this is baking. I am definitely giving this one a go! Looks super delicious and pretty easy to make my two favorite things. Thanks for sharing. YUM! What a delicious spin on a holiday dessert. I can imagine this cheesecake smells utterly delightful and TASTES like the holiday season – so good! What a perfect Christmas dessert! It looks heavenly! What a great festive dessert! So flavorful and pretty! I’ll have to make this soon! 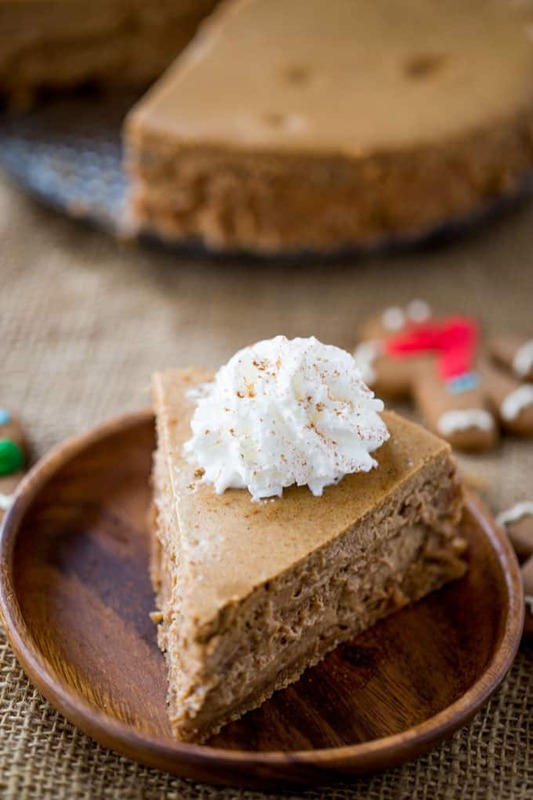 Gingerbread and cheesecake in the same dessert…heavenly! I’ll take mine with a double crust, too! It is so amazing with that river of crust in the middle it is making me want to bake a second one even though we have some of this one left in the fridge still! I’m addicted to gingerbread. I absolutely need to try this asap!! My husband’s grandmother used to make a gingerbread cake at Christmas time. I have a feeling he would love this cheesecake! Aww I love grandma’s and their holiday cakes. It is one of my favorite memories of her. This might be the prettiest cheesecake I’ve ever seen! It sounds absolutely perfect for the holidays!